Don’t let the small size fool you! 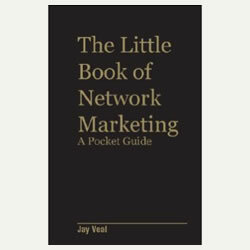 This handy pocket guide packs all things network marketing from A to Z into one concise reference guide that you can take with you anywhere. With an interactive section that allows you to keep your “Why”, your goals and your progress in front of you at all times, The Little Book of Network Marketing can be your guide to networking success. There is even a tool on the back of the book cover to “Save your Seat” at networking events. This book covers it all! The author achieved his company’s top compensated leadership position in 14 months and he has penned the steps he took along the way. Not just pie-in-the-sky theory, this little book packs a big punch with practical steps you can take to successfully launch your professional network marketing business. Easy to read and sized to fit in a man’s pocket or a lady’s purse, take it with you and use it when you need it, wherever you need it.